Today is the first day of the Epcot Food and Wine Festival! It’s the most wonderful time of the year! With that being said, there are a few things that I wanted to update you on, if you are going to the Festival this year. The first update is about the Chase Lounge. Once again, the Chase Lounge is back in the same location as it previously was; on the third floor of the American Adventure Pavilion. Guests can go to the Lounge to cool off, grab a beverage, re-charge your batteries (phone or personal), and simply relax. However, there are a few new things that have been added to the lounge’s amenities. Enhancements for this year include a dedicated Festival Information desk, a social media photo booth, and a station where guests can email recipes from the festival. (Yum!) In addition, periodically throughout the festival, the lounge will host animation sketch classes and will feature caricature artists for guest enjoyment. Guests will also be able to pick up wristbands for special seating for the Eat to the Beat Concert Series. The second update is all about the Remy’s Ratatouille Hide and Squeak scavenger hunt. Guests who would like to participate can purchase a map and stickers at either Disney Traders, the Festival Center, Pin Central, Port of Entry (Plaza Towers) or World Traveler (International Gateway). Guests will then help Remy by finding little Remy statuettes and collecting ingredients for his signature dish, ratatouille by searching throughout World Showcase for the cute creature and placing the ingredient stickers onto the map that represents that particular location. Guests will be able to return the map (which doesn’t have to be completed) to the redemption location of Port of Entry (Plaza Towers). Once they return, the guest will receive a limited release pin. Guests must return their map to this location by November 16. Maps/stickers and surprises are available while supplies last. The third update is that another new event for this year will be live roasting demos courtesy of Joffrey’s Coffee. Guests will be to participate in this experience courtesy of Joffrey’s very own Roastmasters, who will share their skills and knowledge so guests can see how beans are perfectly roasted for our consumption and enjoyment. The roasting demos will take place in between Innoventions and Ellen’s Energy Adventure on Saturdays and Sundays at 12:00 p.m., 1:00 p.m., 2:30 p.m., and 3:30 p.m.
For Guests who have enabled Location settings in their Facebook app and who have Bluetooth turned on, Facebook Place Tips will show them fun, useful and relevant information about each of the Global Marketplaces as they make their way around the World Showcase. They’ll also be able to save content such as recipes or videos to access later using bookmarks. 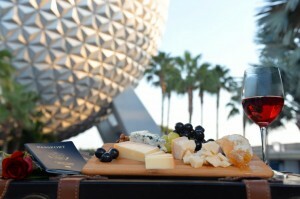 For more information about the Epcot Food and Wine Festival, make sure to check out our page describing the event. Do they still have paper passports? They do! You can pick it up at the Festival Center or I believe the Marketplace Booths, as well!